You can use --report as often as you like in one run to create different type of reports. When defined, this must always be the last element of the --report parameter. Maximum number of pages (default: 1000) - after this limit only pages that have problems will be stored. Maximum number of hits per page reported. Every check will be considered individually. Maximum number of hits per document reported. Every check will be considered individually. Sets the desired language for report files. To adjust PDF-reports easily, HTML-based custom reports can be used. The visual appearance is controlled by a HTML-Template and Custom Style Sheets (CSS), while the reported details are directly requested from pdfToolbox or (optionally) parsed from an internally created XML-report. 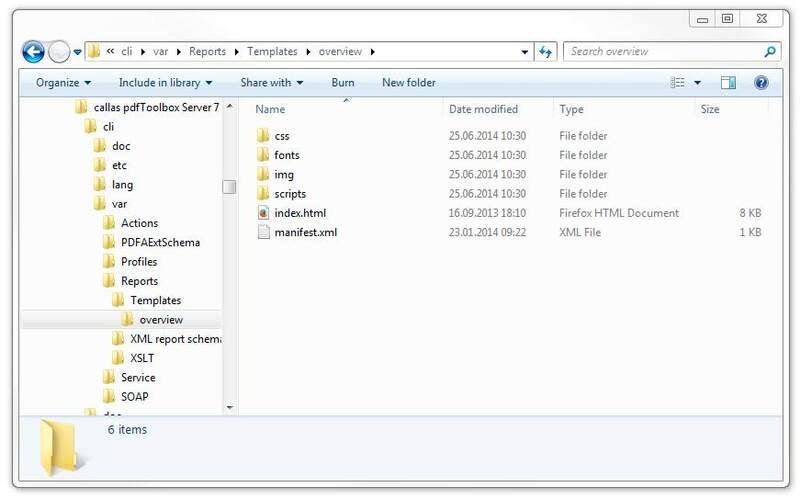 The manifest.xml defines the set of information to be provided by the pdfToolbox engine. This information will be used to to fill up the details in the report based on the HTML-Template. The display name in the user interface is defined here as well. For developing purposes, the internally generated, filled HTML representation of the report can be maintained to review changes in the template files also in a browser. The HTML converter is using WebKit, so it is recommended to use Safari (or Chrome, which is based on a spin-off of WebKit) as a browser. Determining the ink coverage will only take place if one of the respective parameters exists. The HTML template can easily be modified using an appropriate codeeditor or enhanced text-editor. The provided HTML-template already contains some "dummy" data, which is automatically replaced by actual content when a new report is generated. So, when doing adjustments to the template with custom profiles and PDF files, it is recommended to keep the temporarily generated files for debugging, as a basis for modifications and their review in a browser. It is possible to use image formats (like JPEG or PNG) as well as PDFs for positioning visual content like logos. If you want to debug your HTML in an HTML Browser you may want to display an image instead of the PDF reference. You can do this by putting identically named files for images and PDF next to each other. The PDF file must be referenced in the <img> tag in the HTML-template. The usage of PDF files allows for higher quality of logos in the resulting PDF report. The provided HTML-template contains already all document and processing information which can be supplied directly from the application. You will find <cals_params.js> and <cals_overview.js> which are used by the engine to create and render the HTML. Please do not modify these files. Custom Dict files can be used to add or modify strings that are used in reports. Since pdfToolbox 10.0 it is allowed for custom dicts to cover strings for custom profiles or unknown Dictkeys in a particular language. This creates an XML for the profile (kfpx). A user can add his own custom language and values (long for Name and short for Comment as in this example). Hello Guardigli, I guess your question is whether it is possible with pdfToolbox to directly send a report via email once it has been created. That is currently not possible. But you could do so using a third party workflow solution, e.g. with Switch. can you use html based custom reports with the report type "COMMENT"? For example page 1 should be the custom overview page and the following pages highlight the preflight hits with comments.